“As the first artist in residence at Juilliard, the French artist Fabienne Verdier spent a semester during 2014 in a temporary “laboratory” in New York. Working alongside jazz ensembles, classical pianists and singers, she explored ways in which sound might be given form through paint and oil stick. The work, she admits, was difficult. “I realized there that to enter into an encounter with others we must leave oneself behind,” Verdier says from her house in Le Vexin, to the north of Paris. “But where danger lies, there too grows the chance for salvation,” she continues, quoting Hölderlin. The results of the experiment are a series of large, multipanel works in which vast brush strokes and streams of oily textured paint cross the picture plane like soundwaves, describing both visual harmony and tension. Two bodies of work created following the Juilliard residency — “Rhythms and Reflections” and a new series of “Walking Paintings” — will be exhibited later this month at the Waddington Custot gallery in London. In working alongside musicians, Verdier hoped to shake herself of mental habits built up over 30 years of work. It’s not the first time in her career that she had sought such a jolt: After graduating art school, she chose to break away from Western painting traditions, moving to Sichuan for 10 years to study painting under the Chinese masters. Since then, Verdier has made a habit of adapting traditional tools to her own purposes. 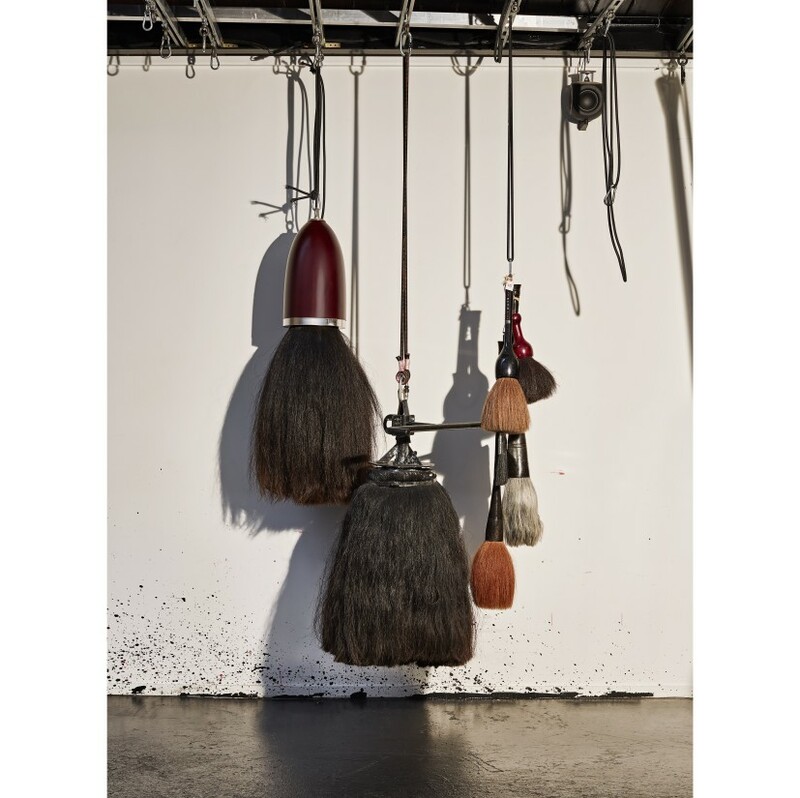 Vast brushes composed of dozens of horsetails are suspended from the ceiling of her studio. Once laden with paint, they are so heavy that she has attached bicycle handlebars to them to retain control of their passage across the meticulously painted ground of her canvases. In her “Walking Paintings,” paint is poured in a controlled stream onto the canvas from a long, soft funnel as the artist completes a suite of movements from one side of the canvas to another. In recent “walks,” these movements have often described passages of music. Verdier’s home and studio were designed around the presence of the great hanging brushes, which are suspended within a painting “pit” illuminated by natural light from the ceiling. Beyond is a building housing her formidable library, where she “calms down her mind” after each athletic painting session by reading poetry and philosophy. Here, too, she sketches out forms for her works, surrounded by twisted branches and stones as well as books on art. “Natural forms taught me a lot about how the inner forces create form,” she explains, “and that’s the way I try to paint.” While each painting embraces an element of chance and the action of gravity, planning and precision likewise play their role.